The Navara has decent safety specification too, comfortable cabin, and good driving manners for a truck of this size - although the ride is quite harsh. Then there is the pricing. 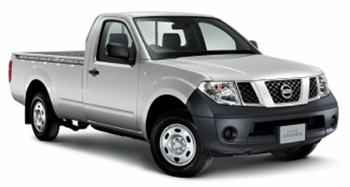 The Navara is very competitively priced, when all things are considered, remember that Isuzu looks reasonable until you start adding extras like : air-conditioning! On paper the Navara seems to have it all, but yet on the sales volume lists the Navara is lagging in 3rd spot in Thailand, well behind the Isuzu D-Max and Toyota Vigo. Toppling those giants would take more than a superior product at a cheaper price. The important thing is having the right range of products, and this is where the Navara has been falling short. Double and Extended cab models are not the big volume sellers. When you see the annual sales figures for trucks, the vast majority of them are single cab trucks. Single cab trucks might not be cool to look at, but they get the job done. Nissan were lacking a single cab Navara, but they are about to put this right, and are hoping that their combination of size, power and price will attract those looking for a workhorse truck. The single cab Navara is due to launch on 6th March, and will be exported from Thailand to 120 markets around the world. Specification will be less impressive for this model, as Nissan attempt to keep the cost down to have any hope of success in this very competitive segment. The Navara Single Cab will come with the 144 hp engine, but rather than the 6-speed transmission found in the current Navara, the single cab model will have a more standard 5-speed manual transmission. The Navara will only have the one trim level and will cost THB 469,000, with central locking and electric windows coming as an option for an extra THB 10,000 baht. Considering that the Toyota Vigo starts at THB 430,000, this might seem a little on the high side, but when you consider the 2.5 litre unit in the Vigo produces only 102 hp, Nissan should have little problem attracting attention. It will be interesting to see how Nissan does now that it has a full range of trucks to compete directly in each segment. Toyota and Isuzu are still enjoying more than their fair share the sales volume, despite ageing products.